TORONTO—Peter Schiff is a noted contrarian. He believes the U.S. is in a worse position than growth-challenged Europe since quantitative easing did not work and is akin to “trying to put out a fire with gasoline.” Schiff also believes the U.S. has worse problems than Japan. Schiff is the CEO and chief global strategist of Euro Pacific Capital, based in Westport, Conn., a full-service, U.S. Securities and Exchange Commission-registered broker/dealer specializing in foreign markets and securities. His best-selling book, Crash Proof: How to Profit from the Coming Economic Collapse, was published in February 2007. Schiff’s fifth book, The Real Crash (Fully Revised and Updated): America’s Coming Bankruptcy, was released in April 2014. He is also the host of the nationally syndicated Peter Schiff Show. He spoke with Epoch Times at the World MoneyShow at the Metro Toronto Convention Centre on Oct. 17. Epoch Times: You mentioned in your presentation that the U.S. will embark on more quantitative easing (QE) and interest rates will be at 0 percent since the U.S. can’t afford to pay a “normal” rate of interest (losses on bond holdings at the Federal Reserve was one reason mentioned). Do you see the U.S. becoming another Japan? Peter Schiff: I think the United States has even worse problems than Japan, so I think the U.S. is going to have a worse outcome. I still think Japan’s got a serious problem but I think it’s not an intractable problem. Japan started from a position of strength. The U.S. started from a position of weakness. Japan had the domestic savings to squander, the U.S. doesn’t; it’s already counting on squandering the world’s savings. The Japanese just started running deficits, but for the last two decades they were running surpluses, and the U.S. has been running deficits for decades and its external liabilities are enormous. Most of the Japanese government bonds are held by the Japanese. Epoch Times: But what about Japan’s 200 percent debt-to-GDP? Mr. Schiff: I’m not saying that that’s not a problem, but I also think that the U.S.’s debt-to-GDP is actually worse when you consider the totality of the debt and also when you look at the vulnerability of the U.S. GDP. The U.S. GDP is 70 percent consumer spending, which is going to collapse, and so the debt-to-GDP dynamic could be worse because the debt could be exploding as the GDP is imploding. Epoch Times: About the U.S. being in a worse situation than Europe—Europe did not undertake quantitative easing at the onset of the financial crisis and is now struggling to find growth. The U.S. is growing and looks like the lone bright spot in the world. Mr. Schiff: Yes, that is the conventional wisdom. Because the U.S. did all the quantitative easing, it is in worse shape. As the effects of it wear off, the U.S. will find itself in a bigger recession than Europe. It’s like the U.S. took more drugs so it got higher and so, in that respect, you can say, “Look at how America’s doing better,” but at what cost? We [the U.S.] only look like we’re doing better because we sacrificed the future to indulge the present a little bit more, but people aren’t connecting the dots and realizing that whatever growth we’re enjoying now comes at the expense of the future recession. The fact that Europe didn’t do as much as we did will benefit them—not that they did everything correctly; they still did some stimulus. They shouldn’t have done any. But the fact that the U.S. did as much as it did … so right now people think Europe should emulate the U.S. It’s very premature to believe that quantitative easing has worked because, in order to say that, you have to be able to remove the stimulus and everything has to be ok.
And the U.S. hasn’t even done that yet—all they’ve done is talk about it. And things are already starting to fall apart. So I think that by next year nobody is going to be holding up the U.S. as an example of what you should do because I think it’ll be obvious to more people that quantitative easing failed when the U.S. have to do it again. Epoch Times: If the U.S. is pouring gasoline on the fire by doing QE, what could or should it have done at the onset of the financial crisis? Mr. Schiff: Not bailing anybody out and letting the market correct the distortions, which involves a reduction in asset prices, a default on debt because we have too much debt. How do you get rid of debt? You restructure it. We needed to have asset prices come down and we needed for the bad actors to be punished. Not all the banks got sucked into subprime mortgages. So let those banks buy out the ones that failed. Instead none of these big banks that acted so recklessly paid for their recklessness; they were mostly all bailed out. And because we made the big banks so much bigger, a lot of the smaller competitors who did act responsibly ended up going out of business because they couldn’t compete with these behemoths. They didn’t have the advantage of being too big to fail. Epoch Times: You mentioned that when people realize quantitative easing is going to go on basically forever, that is going to be the game changer. In that situation, what will the world look like? Mr. Schiff: The big change will be in the financial markets. There’ll be a big drop in the U.S. dollar, there’ll be a big run-up in gold, and there’ll be a rebound in commodities. Initially, it’s going to be a positive because what has been herding the global economy has been the anticipation of this liquidity drain and all this money flowing into the U.S. When it reverses, a lot of these countries that are under pressure right now (example of Russia), the pressure’s going to be off these currencies. A lot of economies are suffering because they’re looking at this big drop in commodities prices, and remember the stronger dollar basically means that more things end up being purchased by Americans, so that means that everybody else has less. But when the dollar starts to weaken, then everybody else can have more, because the Americans can’t afford as much. So we reward banks for their size, but not for their prudence, and we just really needed to let the economy and the free market untangle the mess that the central banks and the government created. But instead we just did QE and the fire got bigger. Epoch Times: So what will the next iteration of QE look like? Mr. Schiff: Janet Yellen has been talking about income inequality. The perception of QE, and it’s correct, is that it benefits wealthy people—people with assets and not the average guy. So I do think the next time the U.S. does QE, they’re going to do something different too. I think they’re going to try to find a way to include the little guy. 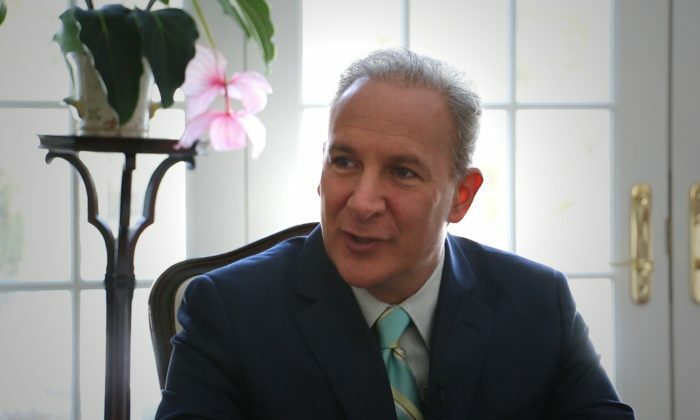 Peter Schiff of Euro Pacific Capital presents his views on the US economy.